Bullring in Birmingham - built at a cost of over ?500 million is a shopper's delight. You can find shops, boutiques and restaurants in this glass-covered shopping destination of the city. Bullring in Birmingham's market centre has come a long way from its early start in 1166. Bull ring in the 1950s had a host of stores from the Army & Navy Store to one of the largest Woolworths. There was considerable planning of the Bull Ring in the 1960s when it became one of the largest enclosed shopping centers outside America. It gradually lost its sheen over the years. Today the Birmingham Bull Ring is all set to change the face of shopping in the city. This shopping extravaganza is part of a larger initiative by The Birmingham Alliance. 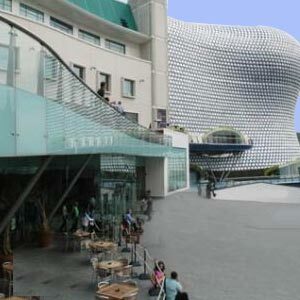 The new-look Bull Ring that was opened in September 2003 is perhaps the largest city centre redevelopment scheme across Europe. Located on New Street down to St. Martin's Church, the Bull Ring in Birmingham offers a wide range of shops and cafes on each of its three levels. The spectacular sky plane roof appears like an invisible expanse of glass giving the 'open' mall feeling. With a parking space for more than 3500 vehicles and improved transport links, shopping at the Birmingham Bullring is a heady experience. The area around the Bullring in Birmingham - New Street, High Street and Digbeth has also undergone a facelift.